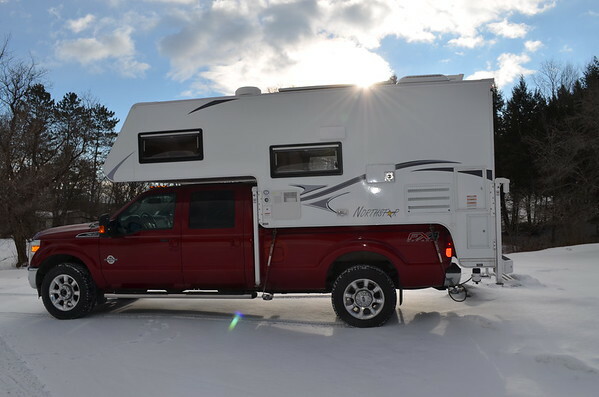 RV.Net Open Roads Forum: FastGuns / Hallmark - how to provide extra camper security? > FastGuns / Hallmark - how to provide extra camper security? I am told that due to the aluminum frame of the current SuperDuty Fords... we have to get the TorkLift FastGuns. but the little (optional) locks on the FastGuns seem only to help discourage anyone from stealing the (valuable) FastGuns.... what about some extra security to make sure to provide extra security for the far more valuable Hallmark? does anyone use additional tie downs - - perhaps the ones hidden by the pickup side walls - so inaccessible from outside the Hallmark? Wouldn't the risk be much greater that the truck is stolen? I have never heard of a camper being stolen off the back of a truck, and the truck still being there. I'd be interested to hear if that has ever happened. We use 4 normal key-coordinated padlocks with long shackles instead of the OEM locks. Mainly because we are in Germany and the padlocks were locally available. The purpose is just to deter someone from unhooking or stealing the FastGuns. I agree. They'll take the whole truck rather than just the camper. Look into the RAVELCO anti-theft system for your truck when you get it. Long shank padlocks from the big box stores work just fine. Thieves will be shot and survivors will be shot again. Up in this neck of the woods we leave our keys in our vehicles and our homes and campers unlocked. Crooks know they may be facing the working end of a weapon if they attempt to steal. Not worth the price, so most leave things that don't belong to them, alone. I'm actually surprised to read this. I've been full timing all over the continent for about 2 1/2 years. I have pins with clips holding my fastguns closed. That's it. No locks. I don't even go to campgrounds. I park anywhere and everywhere. New York City, Miami, sketchy small meth type towns, Los Angeles, El Paso, Coachella, Detroit, San Diego, San Francisco, LA suburbs, San Fernando Valley, West Covina, Santa Clarita, Orange County, Burning Man, Denver,Boise, you name it, I've parked overnight in it with this setup. Never even in a secure campground. I think you're overly concerned with fastgun theft. No one even knows what they are or notices them except other TC owners. I also doubt anyone is stealing a TC/truck combo. They stand out like crazy and are impossible to make a getaway from law enforcement in. Stealing the TC by itself is literally impossible without a forklift specially designed to have long tines to support it. Mine has been on the streets about 900 nights now. Only security issue was a truck driver trying to break in in Ottawa Canada. He gave up after he found the door was locked. Have never had an issue with security. We have the original pins on the Fastguns, no locks, and have been all over the US with never an issue. I suppose if I abandoned the truck and camper for weeks and never came back to it someone might get curious about if it was available for "borrowing" but I can't imagine taking the camper off the truck - maybe steal the whole kit and caboodle but not just the camper. I'm probably too trusting but IMHO locks just keep honest people honest. Real crooks will do whatever they want. I doubt anyone could steal just the camper. But the Ford is supposed to be the easiest truck to steal. Door locks aren't very good. If you park in an urban area, try to back it up to an immovable object, tree, sign post, etc. Sometimes thieves use a wrecker to steal trucks, particularly in pay to park lots. Many trucks stolen in border states are headed to Mexico. I'm with the others. They're far more likely to just steal the whole rig, and that's easily done by a heavy wrecker with a wheel lift, a cordless impact wrench, and a short ratchet strap. Lift the front with the wrecker, and while one guy is strapping the wheels down the other slides under the truck and braap-braap-braap-braap, off comes your driveshaft. Rickety-rack-rickety-rack, your driveshaft is strapped to the frame rail, both guys are in the truck and it's GONE. That's standard operating procedure for a tow truck driver, so unless you're there screaming your fool head off, nobody will be the wiser. They'll probably have the yellow lights flashing, be wearing reflective vests and hard hats, so they look official, like they belong there. Again, unless you're standing there screaming your fool head off, everybody will assume it's a routine tow. The standard locks are enough to prevent the typical thief, who is only looking for something easily removed to sell as scrap. Putting 10-ply tires on half ton trucks since aught-four. You were told wrong on two counts. The frame is steel, just the body is aluminum. The Fastguns are merely the turnbuckle that connects between your camper and the tie down system on the truck. There is no reason why ordinary turnbuckles could not be used structurally. Fuel door location may be a good argument for Fastguns, though. And fwiw, maybe reconsider removing the camper jacks. Not sure why one would do that anyway, save for doing some 4 wheeling where they could get damaged. The pros of having jacks on the camper outweigh the cons by like 100:1. Flat tires, truck needs repairs, using camper as home base and having a “normal” vehicle to drive around, etc.